And now readers, you get a bit of a history lesson. A long time ago (in PSO terms) there was a site known as PSO Quest. Those of you who have been on the game since Sega's servers may remember this site, it was one of the best PSO sites around. Not only was it well designed and pretty to look at (unlike this one... ^^;) but it had accurate and complete information on almost all topics. When the Gamecube version was released they added GC info, but unlike PSO-World their Ver.2 information remained accurate and useful. Unfortunately the site ended up disbanding and its owners scattering, and while the domain stayed up for quite a while and people thought it might come back as a Phantasy Star Universe site, it wasn't meant to be. The domain expired and psoquest.com is no longer with us. It was at PSO Quest that I first learned about Challenge mode, sometime around 2002 I printed out their guides and used the maps they hosted to help me play with the Japanese users on Sega's DC server. I hope to make this section as useful, and possibly even more useful, than their Challenge section was then. I originally thought that the maps on PSO Quest during that time were translated by the staff; unfortunately I never saved the maps and only printed them out. I had been delaying putting up a Challenge section to this site until I could find a Photoshop/GIMP expert to help me clean up the low-quality scans I made of the guides. That is, until recently. Thanks to my old friend from Sega's DC server Tweeg, (whose site you can find here, please consider visiting it. ;D) I got a link to a site that was still hosting the images. A big thanks goes out to Thyanura of pso@ghoul.net for still having the images hosted. Though I recall hearing of Thyanura somewhere, apparently the site stopped being updated in 2002. According to the site, the maps I used back then were translated by Mamak Int, however their site went down in 2001 and never returned. Thusly, I bring you those same maps that I used back then, thanks to Thyanura for having them hosted for so long and Tweeg for showing me that they still existed. Q: So, what exactly did you do if you're just mirroring old maps? A: These are certainly old maps, but I'm also writing up strategies for the characters, explanations of Challenge mode etiquette, and walkthroughs to accompany the maps. Q: So, where's this information coming from? A: Some of it comes from the text accompanying the old PSO Quest guides, however I hope to expand on everything from my personal experience playing with the Japanese Challenge players on Sega's DC server as well as bolster it with what I've learned since then. Q: So you must be pretty amazing at Challenge mode then, huh? A: Well, I'm better than a lot of people these days, but I'm in no way the best Challenge player ever. There are people who've played it more than me, who can clear the stages faster than I can, and who have more S-Rank weapons than I do. However I've played enough that I think I've gathered quite a bit of knowledge that will be useful for novice Challenge players. It's my hope everything here will be useful to at least somebody. Q: So once I read all this stuff, will I be a Challenge master? Q: So, where did the images and stuff come from? A: The area maps and De Rol Le images came from Thyanura's site, which is, at the time I'm writing this, mirroring the images from Mamak Int. I'm using the divider images, the Challenge stage buttons, and the Dragon image from PSO Quest's guides, as well as a modified version of the PSO Quest & Crab Cult Challenge mode banner, the original of which can be seen at the bottom of this page. If you were an old PSO Quest visitor like myself, you may recognize them but I'm not going to use them without giving credit, even though PSO Quest is no longer with us. I did remove the PSO Quest and Crab Cult references from the image I put with my guides since they are not clones of the guides originally written by PSO Quest and Crab Cult, but my own guides incorporating information from their guides. I managed to scavenge these images from the Internet Wayback Machine. The other images are mine. 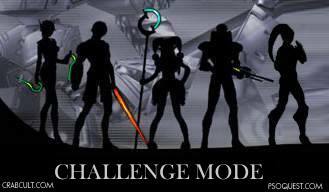 With that said, I hope people enjoy the information contained here about Challenge mode. My site is really just a hollow shell of what was once the glory of PSO Quest, but I hope I can somewhat fill the void they left through their absence.